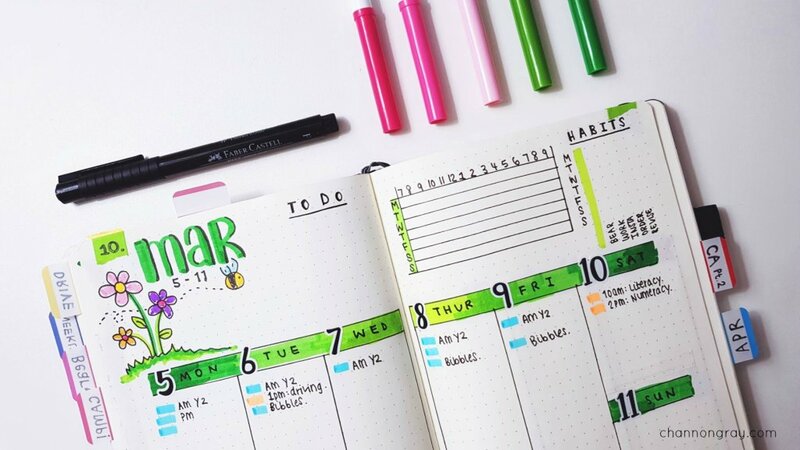 Getting organised will reduce your stress levels, increase productivity, allow more time for focusing on personal wellbeing as well as ensuring that you never miss a deadline, appointment or event ever again; the bullet journal system can assist you into achieving absolute organisation goals like you’d never believe! I’ll be honest, up until recently, I have lived my life in a field of chaos; although I always knew what I was doing/where I was going, my time management skills and productivity success wasn’t exactly sky-rocketing. One of my 2018 resolutions was to be more in charge of my life, on-top of getting tasks done and aim to fulfil as many goals as possible. The bullet journal system has helped me to begin to achieve these things. Bullet journalling can be as simple or as creative as you’d like it to be. I cannot resist doodling or sneaking out my hoards of washi tape. But I agree, this way of organising isn’t for everyone. Many people like simple journal layouts using only a notebook and black pen; and that is the beauty of this, a bullet journal is designed to suit EVERYONE and ANYONE! It’s is supposed to contain everything you need it to. For example grocery lists, to-do lists, household cleaning trackers, goals, habits, appointments, events and random notes. It satisfies all the organisational requirements. First things first, if you need help setting up a bullet journal then I have written a guide on how to do so here! You need a ‘future log’. This is a place to store upcoming memorable dates or appointments. I’ll leave a photo of mind below! Plan ahead if you need to. You might be thinking, but how on earth can I plan ahead in a bullet journal? Well, simply set up your spreads in advance. I have every week in my journal up until the beginning of May but they are what I like to call ‘skeleton spreads’; they are undecorated, dated weekly layouts with enough space left in between weeks for everything else I like to add at a later date (notes, memories, monthly calendars, expense trackers, etc). It’s flexible, customisable and forgiving system of organisation to use. If you miss a week, it doesn’t matter. If you make a mistake, then simply move on. Likewise, if a certain spread or layout doesn’t work for you, then just change it next time or forget it completely! The Bullet Journal is Accessible! 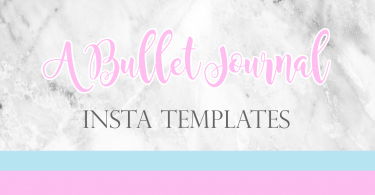 The bullet journal is highly accessible to all and it takes some time to get used to it. I enjoy mine for the creative and wellbeing element it offers me when planning the future. Meanwhile, others get a kick out of its capacity for simplicity. 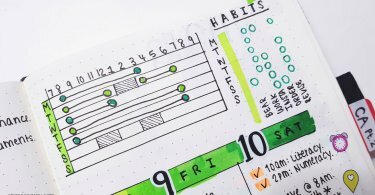 There is no right or wrong way to ‘bullet journal’. I would research, set-up and utilise some of the following spreads when first getting started on a bullet journal. This list will help you to stay productive and organised! Yearly calendar at a glance. Key – a personalised key to suit your planning needs. Goals page – this enables you set targets and focus on them. Any weight-loss or financial trackers you might wish to have documented. Hopefully, this list will help you assist finding an absolutely organised life. If you have any further bullet journal advice or organisation tips, please leave them below or if you’d like to contact me then you can do so here. I am so impressed with people that can do this though!! You would – it just takes time to find your most productive, and therefore organised, planning routine! Give it a go? You might surprise yourself! I’ve been considering a bullet journal for a while and finally started yesterday. I’m still figuring out what’s going to work for me, but so far I love it. I love your ideas! Eeek I am so glad that you’ve got started. It will take a while to not only get used to but also figure out how to make it best fit your life. I’m glad you’ve found inspiration and enjoyment in my post as well as your journal – that makes me incredibly happy! That’s still very similar to a bullet journal, they need not be pretty or arty but functional is the main aim. I just cannot resist combining the two and making a scrapbook out of my planner all at once! I did not do well with Bullet Journaling. Props to you for being able to!! It isn’t for everyone and that is absolutely okay! I’ve never heard or used a bullet journal, but I’m so OCD and need to be organized and this makes me want to start bullet journaling!! Love it! I know that it could be a struggle to give into/used to, however, once you find your groove, it will be absolutely worth it! This post is right up my street Channon! I’m also a stationery addict and I’ve fallen in absolute love with bullet journaling. I mostly use it for list making (I always have tons) and writing down goals, ideas, etc. Then my more traditional planner is for my daily tasks and reminders. I’m buying a new bujo soon and absolutely adore the Copper colour of the Leuchtturm. Going to Ryman’s soon to get one! I am glad you liked it. I just cannot help myself when it comes to stationery – I just need to buy it ALL! I’ve been eyeing up the copper version for a while, I think that would be a good move for your new journal! I love my bullet journal for the creativity, but I really need to use it more for organizing and forming better habits. How do you keep up with it? Do you journal at a set time every day? Review in the morning or another time? I’m all for the creativity and I agree that finding a creative-productive balance can be tricky. So basically, I sit down each night for about 20-ish minutes and plan out the upcoming day – I work 8am-6pm weekdays and so don’t have an awful lot of time to faff about with it all. But I journal in the evenings as it’s relaxing and I like to see what is coming up in the next 24-48 hours ahead of me. I review it throughout the day in order to stay on top of all my scheduled tasks! I hope that helps! I seriously need to give bullet journaling a go, yours looks so cute! Aw thank you Emily! Please do give it a go, I bet you’ll really enjoy it! I think it’s about time I start bullet journaling! My planner is currently a hot mess… thanks for all the info! You are most welcome Kayla! I think you should too but then again, I’m biased. I just love mine so much, it’s an extension of me! I am usually one to coast between loads of different planners, I am never set on but then I am 3 months into this one and still going strong – probably a personal world record in terms of planner commitment for me! I have used a bullet journal for about a year and half and love it. Not as detailed as your but has kept me on track. Just started a new one this month so excited and yes used Washi tape!! 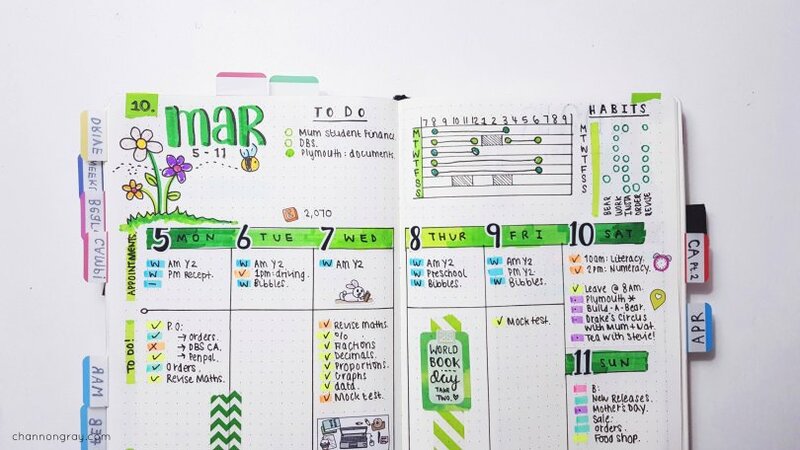 Washi tape is an essential tool when bullet journalling – it can put colour as well as spruce up any page! For as long as it works for you then that is all that matters. Good luck on your journalling adventure – I’m in need of a new one soon, eeek!